Chicken and Ham Pie with FA Cup Trophy! 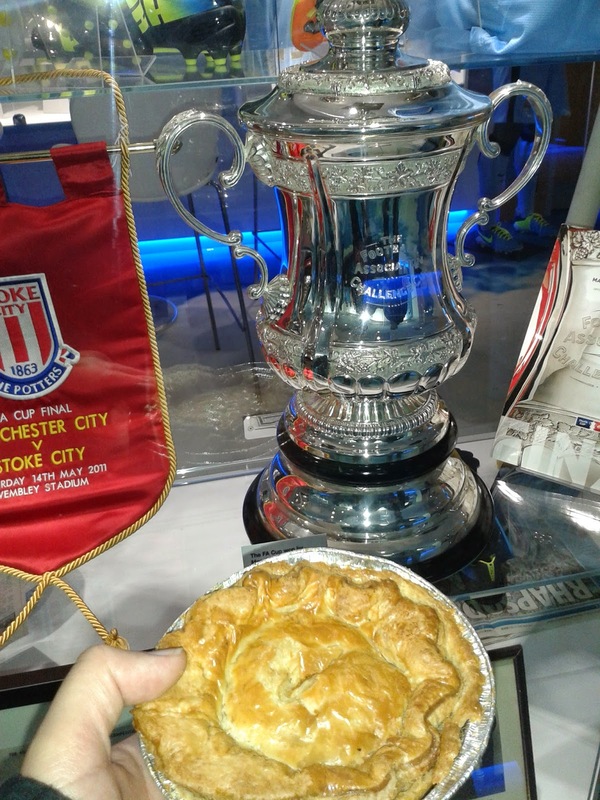 “Are you the guy from that pie site, the one on the BBC?” was the question asked of me, as I took a photo of my chicken pie in front of Manchester City’s FA Cup trophy. “Yeah, that was me!” I replied, handing them a Pierate business card from my wallet. I had, of course, been present at the Manchester City v the Magpies (Newcastle United) game primarily to rate the pies, but it was nice to be recognised by some fellow pie fans! The occasion was specifically to rate the Fabulous Fan Fayre pies – a company linked to chef Jamie Oliver – who have been catering at the Etihad Stadium for the last year. Having already been in the news and having won a silver award at the British Pie Awards 2014 (for which we were one of the judges), the chance to rate a pie at the home of the Premier League champions was an offer I couldn’t refuse! It had kindly been arranged by Danny Wilson (Sales Director), who I had met at the BBC Radio 5 Live Debate on the Price of Football (for which we featured as pie advisers). "Are you the guy from that pie site, the one on the BBC?" Yep - genuinely just recognised as a Pierateerat the @MCFC match! I met Dan Schofield (Head of Operations) on the night, who met us at half time to take us to get some pies and then chat to us about them during a visit to the trophy room. It was great to meet such a high level official at the club who clearly knew his stuff when it came to the pies, and my respect grew when having chatted to us for a good 20 minutes or so he told us he needed to go and help an 84-year old lady, who still does the half-time snacks for all the balls boys and girls, to her taxi. Dan told me about some of the promotions on pies that they offer within the stadium, including rewarding loyalty with a free pie on occasion and deals for those who eat at the ground before kick-off. They were also trialling contactless card payments in the stadium, which they hoped would help speed up the food payment process and ensure fans got their pies quicker! No complaints from me there – as I’ve definitely got fed up of waiting for my half-time pie in many football grounds up and down the country! So what of the pies then?! We were delighted to get our hands on the two new summer signings of an already impressive team sheet – a Beef Bourguignon and Chicken and Ham Pie. Both were served with delicious crispy fries, but of course we all know that like us you’re mainly interested in the pie, which comes in at what I ultimately deem a fair price of £4.00 per pie. By no means the cheapest pies out there, these turn out to be some of the more expensive pies in the Premiership, as deemed by the BBC Price of Football study. But I agreed with Dan’s sentiments that actually people are generally willing to pay £4 for a top quality pie over one at just £2-£3 which is nothing special. I for one thought that £4 each for these two pies was just about right, for a meat packed pie of such quality that was produced on site. The Beef Bourguignon pie was filled with lean chunks of tender beef, button mushrooms, a red wine jus and delicate herbs. 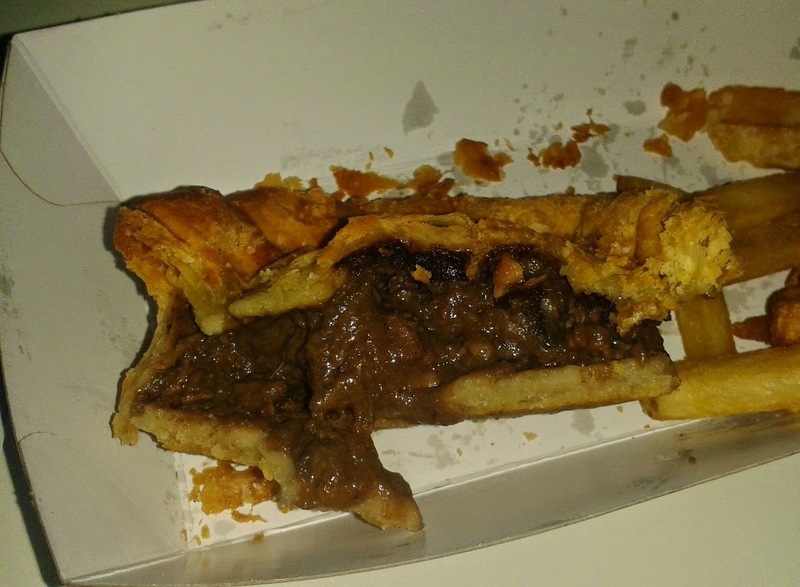 The pie was nice and meaty, with a pleasant gravy which wasn’t too runny (a key ingredient of a football pie). The flavours were nice and the beef lovely and tender, though it could have been a little more exciting in flavour. The pastry was crisp and delicious to eat, though a minor criticism was that the edge crimping was just a bit too large and dry for my liking, meaning the pastry:filling ratio wasn’t quite right. The extra crimped edge does give a distinctive appearance to the pie but isn’t really necessary and off-balances the pastry:filling ratio rather too much. The Chicken and Ham pie was filled with large pieces of chicken breast, cured local ham and a light cream sauce. While I didn’t get as noticeable a flavouring of ham within the pie as I would have liked, the taste was still delicious and there was certainly no missing the large chunks of chicken. The sauce was creamy and worked really well with the meat filling, balancing well with the light, crisp pastry. Again there could have been a little less pastry crimping to balance the filling perfectly, but the pastry was so nice and balanced the filling really well. This slightly edged it for me. In summary, these aren't just good football pies, these are great pies full stop. Packed full of meat, nicely flavoured and with delicious crisp pastry, so £4 a pie is pretty reasonable. You can tell they have gone for quality over quantity when it comes to these pies, but still managed to make them filled with flavour and easily some of the best pies I’ve had at a football ground. They comfortably take 2nd place in our Pieremiership table. It’s good to know that Manchester City still have a few other pies in their locker, with the Potato and Meat, Peppered Steak and Chicken Balti pies all apparently having undergone a makeover since last season to mean they taste even better than before. My thanks to Dan Schofield for being such a great host and I hope to rate even more Fabulous Fan Fayre pies in the near future. Back of the net!